These books are basically the epitome of "beach-reads". Each one takes place during the course of different summers in Belly (Isabel's), Conrad and Jeremiah's life. They have all known each other since they were kids. So they all have a pretty close relationship. Both Conrad and Jeremiah have always looked out for Belly and have always been there for her, regardless of those slightly obnoxious times of endless teasing. It's not until one particular summer that Belly starts to question her feelings for one of the boys. Which then gets even more confusing for her, when she starts having feelings for the other one too.This obviously turns out in a love triangle. I know many people tend to get put off by love-triangles, but let me just tell you that this is one of the, if not the best, and most wonderfully written love triangles I have ever read about. It;s not one of those that begins to get old or feel tacky over time. You see, this one of those that really doesn't allow your interest to falter and will really stick with you for a long time. All throughout the series, I began to really sympathize with Belly and her feelings. And with the difficulty of her situation. Which goes to say, that Belly is without a doubt one of my most loved characters. She seemed real and genuine. I could easily visualize and imagine her as a real person. Further into the series, I begun to see myself as Belly. Now, that might sounds creepy, but I honestly don't know how else to convey to you guys the level to which I could relate to her.I could see myself doing so many of the things she did and making so many of the decisions she made. It was crazy. When it comes to the rest of the characters, I feel it is quite important for me to tell you how amazing they were. Not just the main characters, but also the parents. I loved how they were mostly always present in the story and how they contribute to it and had significant importance to it. Family is clearly a huge topic in the series, but it also deals with loss and moving forward, All these things gave a lot of depth to the characters and it really made me see that there was always something more tot hem than meets the eye. The romantic aspect in this book/ series was something that I lived unconditionally. Wether it was Conrad or Jeremiah, I was getting some serious feels. Each one of the boys was a completely unique and well-written character. And although at the beginning they might come off as just a tad bit vapid, you will soon start to witness the outstanding character development that each character goes through. When you read this series, you are watching all these characters grow. You experience them dealing with so many difficult things and with finding themselves and what they really want. If you want an amazing and engrossing summer read that will have you swooning and crying and laughing, then go pick this series up. Well, I'm glad! 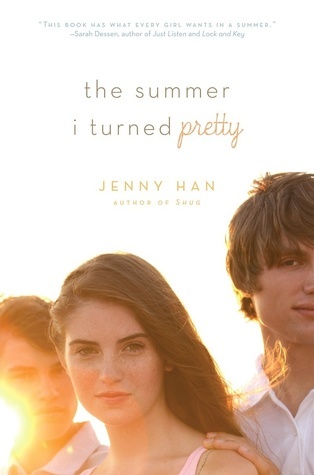 Jenny Han is a really good writer and this series is just amazing. Great review! I've been meaning to read this series for a while because it seems like the perfect summer read. I really liked TOTBILB and PSISLY by Jenny Han, so hopefully I will like this too! Sorry for replying so late to your comment! I'm glad you liked TOATBILB and PSISLY! I still haven't read the second one but Im so excited to do so soon. I hope you get the chance to read this series soon. Clearly, I've changed my template by now, but I'll gladly send you the link from where I got it!